When you’re ready for a new roof, you have plenty of decisions ahead of you, one of which being the color of tile roofing you go with. The color and shade you choose will not only impact the look of your home, but so much more. Before you meet with your roofer to start work, taking the time to research factors that will affect you. The Roof Authority is Fort Pierce’s expert in commercial and residential roofing. We’ve been in the business since 1993, and not only have experience, but are fully licensed, bondable, and insured. We specialize in commercial roofing, as well as residential and green roofing, and can maintain and service your roof as well. Give us a call for your free quote today! Here are some things to keep in mind when choosing between light and dark tile roofing. As you likely already know, darker colors absorb heat, where lighter colors reflect it. This means that, under the blazing Florida sun, a lighter-colored roof is going to be more likely to keep your home and attic cooler. And that means your air conditioner could get a bit of a reprieve, reducing your cooling costs. There are several studies that have shown the effect lighter roofing colors have on energy efficiency in the home because temperatures of a white roof and a dark roof can have as much as a 50-60 degree difference. The color and style of your home will affect the color you choose. You really don’t want to choose something that will clash horribly, and potentially reduce the appeal of your home to a future buyer down the road. You’ll want to meet with your roofing company to determine what type of roof to go with, which could range from shingles to tile roofing to wood and more. You might be surprised to see what the styles of shingles can do to the overall look of your home! Your hands might be tied if you live in a neighborhood governed by a homeowners association (HOA). 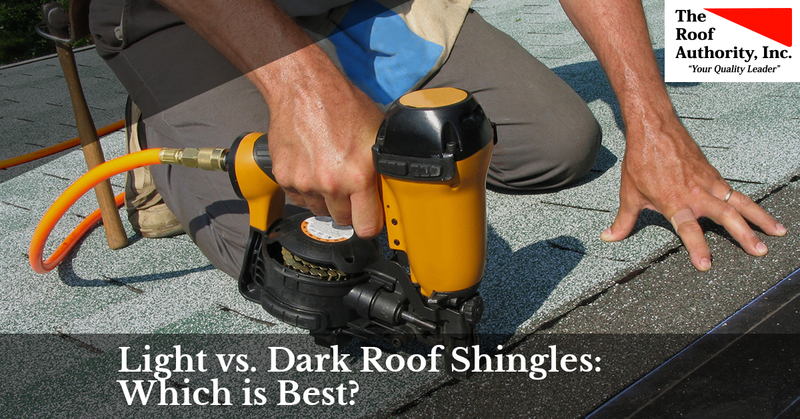 Your HOA has very likely determined the style of roof you can have, so you won’t have much say over whether or not you have a light or dark shingle. However, if the shingle they’ve chosen isn’t as energy efficient as you would like, your roofer can make up for it with different types of insulation, for example. When it comes right down to it, what you like is really the most important factor in what you choose. If you think a lighter-colored roof will be more energy efficient but you can’t find a shingle you like, don’t sweat it. Choose what you like (barring HOA rules), because the investment you make is going to be on your home for at least 10-20 years. When you’re ready to buy a new roof, you need to reach out to a local roofing company you can trust. Contact The Roof Authority in Fort Pierce for all your roofing needs today!